Environmental Racism research papers examine the negative conditions that impact environments where people are marginalized or disenfranchised as a result of racial discrimination. 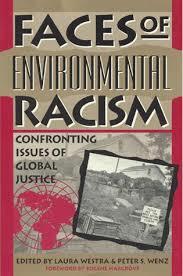 Environmental racism research papers focus on the sociological aspect of environmental problems. Environmental racism can also look at the political side of why the policies that are implemented in the United States are racist. Either way, Paper Masters will custom write your research paper to focus on any topic regarding environmental racism. Environmental racism refers to conditions that have a negative impact on environments where people who are already marginalized or disenfranchised as a result of racial discrimination. In some cases, environmental racism is manifested by regulations or policies that impact those environments while in other cases, it is an outcome of the social and economic circumstance of certain populations. An example of environmental racism caused by regulations or policies is the decision by authoritative bodies to develop or maintain hazardous circumstances such as landfills, industrial sites and hazardous waste facilities in areas that are disproportionately populated by low income and minority families. One of the most prominent examples of environmental racism over the last two decades has been the disparity in exposure to environmental lead among different ethnic and socioeconomic groups. The use of lead-based paints was a common practice during the construction of homes in the last half-century before exposure to the lead content in the paint was recognized as an environmental hazard, especially for young children. Although the use of lead-based paints in residential environments is now prohibited, countless older structures are used as residences for low income and minority populations still exist. Lawmakers have endeavored to mitigate environmental racism through the establishment of the Environmental Justice office of the EPA, which is responsible for the development of regulations and policies that will prevent this type of environmental discrimination. Human Environment Interaction - Human Environment Interaction research papers examine the complex, adaptive, and interconnected systems between humans and the environment and how they interact on an almost constant basis. Cradle to Cradle - It will examine whether the concepts in this reading can help save the environment. Ecology research papers discuss the science between the relationship of organisms and the environment. Environmental Pollution research papers discuss the global impact pollution has the on the Earth and it's organisms. Environmental Ethics Research Papers delve into an order placed on an essay with specific source requirements. Deforestation Research Papers examine environmental research and illustrate the effects of clearing forests. If He Hollers Let Him Go Research Papers delve into a story of a psychological exploration of the effects of racism. Skinheads - The racist skinhead movement continues to have breakouts throughout the United States. Paper Masters writes custom research papers on Environmental Racism and examine the negative conditions that impact environments where people are marginalized or disenfranchised as a result of racial discrimination.